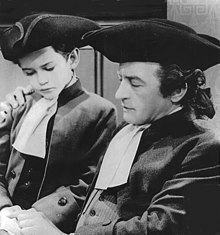 Actor Claude Rains (right) was sometimes a leading actor, sometimes a character actor, often cast as a sophisticated, sometimes "morally ambiguous" man. 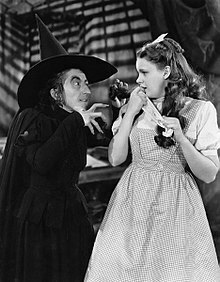 Character actress Margaret Hamilton (left) in real life was a "sweet, gentle woman" who even taught kindergarten prior to working on Broadway and Hollywood, which was different from her on-screen persona of the Wicked Witch in the 1939 film The Wizard of Oz. Unlike leading actors, they are generally seen as less glamorous. While a leading actor often has physical beauty needed to play the love interest, a character actor may be short or tall, heavy or thin, balding, older, or simply unconventional-looking and distinctive in some physical way. For example, the face of Chicago character actor William Schutz was disfigured in a car accident when he was five years old, but his appearance despite reconstructive surgery helped him to be memorable and distinctive to theater audiences. Generally, the names of character actors are not featured prominently in movie and television advertising on the marquee, since a character actor's name is not expected to attract film audiences. The roles that character actors play in film or television are often identified by only one name, such as "Officer Fred", while roles of leading actors often have a full name, such as "Captain Jack Sparrow". Some character actors have distinctive voices or accents, or they develop memorable mannerisms. A character actor with a long career may not have a well-known name, yet may be instantly recognizable. During the course of an acting career, an actor can sometimes shift between leading roles and secondary roles. Some leading actors, as they get older, find that access to leading roles is limited by their increasing age. In the past, actors of color, who were often barred from roles for which they were otherwise suited, found work performing ethnic stereotypes. Sometimes character actors have developed careers based on specific talents needed in genre films, such as dancing, horsemanship, acrobatics, swimming ability, or boxing. Many up-and-coming actors find themselves typecast in character roles due to an early success with a particular part or in a certain genre, such that the actor becomes so strongly identified with a particular type of role that casting directors steer the actor to similar roles. Some character actors play essentially the same character over and over, as with Andy Devine's humorous but resourceful sidekick, while other actors, such as Sir Laurence Olivier, have the capacity of submerging themselves in any role they play. That being said, some character actors can be known as "chameleons", actors who can play roles that vary wildly. One such example of this is Gary Oldman. Some character actors develop a cult following with a particular audience, such as with the fans of Star Trek or The Rocky Horror Picture Show. Character actors tend to play the same type of role throughout their careers, including Harvey Keitel as a "tough and determined guy", Dame Maggie Smith as an "upstanding lady matriarch", Christopher Lloyd as an eccentric, Claude Rains as a "sophisticated, sometimes ambiguously moral man", Abe Vigoda as a "leathery, sunken-eyed" and tired hoodlum on the verge of retirement, Christopher Walken as a "speech maker", Vincent Schiavelli as "the confused guy", Fairuza Balk as a "moody goth girl", Steve Buscemi as "a quirky, smart guy with a mind just outside of reality" and Forest Whitaker as a "calm, composed character with an edge and potential to explode". Ed Lauter usually portrayed a menacing figure because of his "long, angular face" which was easily recognized in public, although audiences rarely knew his name. Character actors can play a variety of types, such as the femme fatale, gunslinger, sidekick, town drunk, villain, whore with a heart of gold, and many others. A character actor's roles are often perceived as being substantially different from their perceived real-life persona, meaning that they do not portray an extension of themselves, but rather a character substantially different from their off-screen persona. Character actors subsume themselves into the characters they portray, such that their off-screen acting persona is practically unrecognizable. According to one view, great character actors are rarely out of work, and often have long careers that span decades. They are also often highly regarded by fellow actors. ^ a b c d Digital Polyphony, Top 25: Great Character Actors, Retrieved 7 August 2014, "...often in supporting roles - rarely are they leading men or leading ladies, and often times they're put into a certain type of role over and over again..."
^ a b c d e A Practical Guide to Working in Theatre, Gill Foreman, 2009, A & C Black Publishers, , Retrieved 7 August 2014, (see page 48) "... much less glamorous effect on their audiences ... chameleon-like ability to play a great variety of roles ... subsuming themselves into the part until they are almost unrecognisable... good character actors are rarely out of work". ^ a b c 28 April 2013, The New York Acting School, Ten Best Character Actors of All Time, Retrieved 7 August 2014, "..a breed of actor who has the ability to be almost unrecognizable from part to part, and yet play many, many roles convincingly and memorably. .."
^ a b David Knox, 4 April 2014, TV Tonight, Good cop, bad cop and Jack Irish, Retrieved 7 August 2014, "... co-leads and cameos ... character actors. But every part plays a character..."
^ a b Stephen Tobolowsky, Discovery, What does it mean to be defined as a character actor? Archived 11 August 2014 at Archive.today, Retrieved 7 August 2014, "In theater, they almost never use the term "character actor." ... leading actors have two names, like, Captain Jack Sparrow ... Richard Kimble -- parts I play ...Officer Johnson"
^ Susan King, May 28, 2010, Los Angeles Times, Hats off to the Wicked Witch of the West and Margaret Hamilton, Retrieved September 2, 2015, "...became one of Hollywood’s most dependable supporting actresses playing, as she once described, "women with a heart of gold and a corset of steel." ^ Craig McLean, 21 September 2013, The Observer via The Guardian, James McAvoy: 'There will be people who walk out of the cinema I'm sure', Retrieved 7 August 2014, "Would he rather be a leading man or a character actor?" ^ a b USA Today, Jude Law's new stage: Maturing lead, character actor, Retrieved 7 August 2014, "...one of Hollywood's most prominent rising stars ... the emergence of a great character actor ... beautiful men and women can have the public get past their looks ..."
^ 23 March 2014, Brian Lowry, Variety, Chicago Tribune, James Rebhorn: Remembering the Quintessential Character Actor, Retrieved 7 August 2014, "Rebhorn worked constantly, but seldom above the marquee." ^ Staff, July 3, 2013, Indiewire, Oh, That Guy: 15 Character Actor Villains You Love To Hate, Retrieved 7 August 2014, "oversized personalities and penchant for playing villainous goons made them unforgettable (even if you couldn't quite place their names)"
^ "The best chameleon actors". IMDb. Retrieved 14 April 2018.